This Elvis Presley biography Jerry Lee Lewis Part 3page is dedicated to providing quality Elvis Presley biography information, pictures and articles for your entertainment. The contents of this Elvis Presley site is written by a fan for his fans about Jerry Lee Lewis Part 3. Jerry Lee Lewis (born September 29, 1935) is an American rock and roll pioneer piano player and singer. 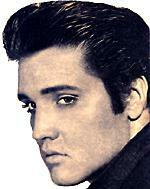 He was, like Elvis Presley, brought up singing the Christian gospel music of integrated southern Pentecostal churches. He began playing the piano at a very early age in his church, and in 1950 he attended Southwestern Bible Institute in Texas but was expelled for misconduct, including playing rock and roll versions of hymns in church. Leaving religious music behind, but bringing its sound and his piano playing talents to the new music developing at the time, in 1954 he cut his first record. In 1956, Lewis joined Sam Phillips at his Sun Records studio in Memphis, Tennessee. Elvis Presley, Roy Orbison, Carl Perkins, and Johnny Cash also began their recording careers at Sun Studios around this same time. Lewis' first recording at Sun studios was his own distinct version of the country ballad "Crazy Arms". In 1957, his piano and the pure rock sound of "Whole Lotta Shakin' Goin' On" propelled him to international fame. "Great Balls Of Fire" soon followed and would become his biggest hit. Watching and listening to Jerry Lee Lewis play, Elvis said if he could play the piano like that, he'd quit singing. His early billing was as Jerry Lee Lewis and his Pumping Piano. Lewis's performances were dynamic. He kicked the piano bench out of the way to play standing, raked his hands up and down the keyboard for dramatic accent, and even sat down on it. His dynamic performing style can be viewed in films, including High School Confidential in which he sang the title song from the back of a flatbed truck and the big-budget film The Girl Can't Help It. Lewis’ personal life was always turbulent but kept from the public until a tour of Britain in 1958 when the press learned the 23-year-old star was with his third wife, Myra Gale Brown, who was also his 13-year-old second cousin. The situation caused a public uproar and the tour was cancelled after only three concerts. The scandal followed Lewis home to America and, as a result, he almost vanished from the music scene. His only hit during this period was a cover of Ray Charles' "What'd I Say" in 1962. His popularity recovered somewhat in Europe, especially in the UK and Germany, in the mid 1960s, but success eluded him in the USA. After more than a decade playing rock and roll, in 1968 Lewis began focussing on country and western music with reasonable success. He achieved many No.1 and Top 10 country hits. Although he toured and played many sold-out concerts, he never again achieved the heights of success that he had prior to the scandal of 1958 despite a major international hit with "Chantilly Lace" in 1973. Plagued by alcohol and drug problems after Myra divorced him in 1970, tragedy struck when his 19-year-old son, Jerry Lee Lewis Jr., was killed in a road accident in 1973. Earlier in the sixties his first son Steve Allen Lewis drowned in a swimming pool accident. Lewis' own erratic behaviour during the latter part of the 1970s led to his being hospitalized and near death from a bleeding ulcer. Following this, his fourth wife drowned in a swimming pool under suspicious circumstances. Little more than a year later, his fifth wife was found dead at his home from a methadone overdose. Addicted to drugs too, Jerry Lee Lewis checked himself into the Betty Ford Clinic. While celebrating his 41st birthday in 1976, Lewis began playing with a .357 Magnum, which he later stated he thought was unloaded. Pointing it at his bass player, Butch Owens, he pulled the trigger. The gun was loaded and Lewis shot Owens in the chest. Owens miraculously survived. A few weeks later on November 23, Lewis was again involved in a gun related arrest at Elvis Presley's Graceland residence. Lewis had been invited to visit by Presley but a security guard was unaware of this. When questioned about why he was at the front gate, Lewis displayed a gun and jokingly told the guard he had come to kill Presley. In 1989, a major motion picture based on his early life in rock & roll titled Great Balls of Fire brought him back into the public eye. The film was based on the book by Lewis' ex-wife Myra and starred Dennis Quaid as Lewis, with Winona Ryder, and Alec Baldwin. The very public downfall of his cousin, television evangelist Jimmy Swaggart, resulted in more adverse publicity to an already deeply troubled family. Swaggart is also a piano player, as is another cousin, country music star Mickey Gilley. Jerry Lee's sister, Linda Gail Lewis, is also a piano player, and has recorded with Van Morrison. Despite the personal problems, his musical talent is unquestioned. Nicknamed The Killer for his forceful voice and piano production on stage, he was described by fellow artist Roy Orbison as the best raw performer in the history of rock music. In 1986 Jerry Lee Lewis was part of the first group inducted into the Rock and Roll Hall of Fame. That same year, he returned to Sun Studios in Memphis to team up with Orbison, Cash, and Perkins to create the album, Class of '55. He has never stopped touring and can still deliver great unique concerts that are always unpredictable, exciting and personal. After several years of inactivity in the studio, Lewis plans to put out a new album in 2005. In February 2005 he was given a Lifetime Achievement Award, by the Recording Academy that also gives the Grammy Awards. At the presentation it was announced that his new album would be made with a line-up that will include Eric Clapton, B. B. King, Bruce Springsteen, Mick Jagger and Keith Richards. The 20-track album will be titled "The Pilgrim".  "Me and Bobby McGee"
 "End of the Road"
 "Who's Gonna Play this Old Piano?"  "What's Made Milwaukee Famous (Has Made a Loser Out of Me)"
 "Another Place, Another Time"
 "Whole Lotta Shakin' Going On"
 "Great Balls of Fire"